It’s tempting to say that just when we got done posting a glowing review for the other side of Roy Brown’s latest release, heartily congratulating him on shedding the outdated trumpet-led arrangements that had always threatened to hold back his otherwise strong material by keeping them rooted unnecessarily in the recent pre-rock past, in the process robbing the songs of the kinetic energy that the best piano, tenor sax, drums and electric guitar led sides that others were consistently featuring to great effect, Roy promptly turns around and spits in our faces. Well, not literally, but you’ll be forgiven if you think so when you hear the return of the trumpets on the elongated intro to ‘Fore Day In The Morning, leading you to believe that the founder of this whole style was perhaps going to be the one who remained least convinced of its viability going forward. Brown is shaping up to be a rather vexing person to cover here on Spontaneous Lunacy (though endlessly enjoyable to look back at too). At once both daringly visionary and occasionally tentative, his career at times appears to be a case of two steps forward and one step back, thus we go from praising the leaps ahead, such as with Rainy Weather Blues, which injected a vibrant electric guitar as the main responsorial instrument, to then being forced to bemoan his seemingly willing return to the staid and unimaginative accompaniment on its flip side (in fact the designated A-side at that) which is featured here. But to jump to that conclusion after just the first fifteen seconds or so would be a mistake, for if there’s something else we’ve learned about Brown is that we can’t ever fully give up on him for apparent missteps as even when he takes a step backwards there’s still always something about the resultant work worthy of some acclaim. Here, as so often is the case with Brown, it comes in very quickly and centers on his vocals, which are typically impressive and in fact absolutely dynamic at times, stretching out with power and emotion as if it were effortless. You can see why guys like Elvis Presley and Jackie Wilson worshipped Brown’s voice and incorporated so much of his delivery into their repertoire, the gospel-like fervor combined with his precision and control was hard to beat and elevates even his poorer conceived records to the point of begrudging respect. So right off the two features, one looking back, the other driving forward, are locked in a struggle for our attention and our initial knee-jerk reaction which was poised to reject the entire record following the rather desultory intro starts to weaken under the sheer power of his voice. But as always with Roy that’s not all that he has to offer in the way of weapons in his arsenal to win us back over. For as good of a singer as Brown is he’s consistently proven to be nearly as good of a songwriter, giving him dual strengths that are the envy of most of his peers of the late 1940’s rock scene. ‘Fore Day In The Morning shows this side of him off as well, from the distinctive title that makes you want to hear what it entails, to the way he masterfully draws out the tension in the storyline by not letting on right away exactly what it’s about, but instead piquing your interest as it gradually unfolds. This is aided by his singing, showing why the two skills themselves, not to mention his awareness of how to have them compliment each other, make him so potentially lethal as an artist. As he draws out the opening refrain about thinking he’s hearing his “baby cry” you wait with baited breath to learn the circumstances in greater detail. You know there’s an explanation coming that’s going to turn this story on its head but you aren’t quite sure what it might be. Your mind races with possibilities. The mood is anguished so you might start to assume that the girl is dead and he’s dreaming about her as if she were still alive, perhaps making Brown the first artist afflicted with necrophilia in rock. Or it could be that she’s running around on him and on this night she hasn’t bothered coming home at all and he’s finding it hard to keep up this charade of pretending they’re still in love… surely the neighbors are going to start to catch on if she keeps tumbling in at 3AM while poor Roy’s been there alone since dinnertime. But while those are but two of the potential outcomes, they certainly aren’t the only directions this can head and it takes us until almost a full minute in to find out for sure, and then only after one more descriptive blast disguised as a potential red herring – that of him wailing It was only a dream… – before FINALLY letting us off the hook to inform us that she ditched him a long time ago and he’s simply not over it. That’s a lot of angst expressed in just under a minute of a record and we haven’t even gotten to the reasons behind it yet! By now your opinion of it all starts to improve. The genius of Roy Brown the writer is that he rarely ever lets it go at the first payoff. Now that the main thrust of the song has finally been revealed, for most that would be enough to carry the entire song home – she’s gone, he’s sad, cue the violins (no, there aren’t any of those here, thank goodness!) and let him sob into his pillow to the fade – and truthfully that might even work effectively enough, especially with a singer as emotive as he is. But Roy’s not someone who’ll be content to keep the things one dimensional for long. When he gets to the bridge, which is effective in of itself for simply the stop-time shift it brings to the tune, that’s when he suddenly unloads on himself by showing that he was the one to blame, by “doing her wrong”, perhaps cheating, or just simply not being concerned with her needs, then admits that he compounded his mistakes by acting completely unfazed, even cocky and disdainful towards her when she first threatened to go, thinking she would never call his bluff. It’s a marvelous development in the narrative because in the process he’s shifted your sympathy from him to her before he pulls it back to him as he grows ever more despondent, even suicidal, as the impact of his plight hits home, namely that he’s an emotional wreck over a situation that’s entirely his fault and he sees no possible way to remedy it now. Just as importantly though from a writing standpoint is the fact that for the second time he’s pulled the rug out from under your expectations, or at the very least has kept you off guard, never quite sure of just where he’s headed, thereby packing more emotional wallop in the resolution to those questions that you find yourself asking as it goes along. With Brown’s best compositions you listen with rapt attention to every word because you simply can’t afford not to. Like a boxer it’s not just the punches he lands that rack up points, its the feints and jabs and ring generalship that keeps you off-balance and winds up controlling the action like a puppet master holding the strings. Roy does that as well as anybody in rock at this point and he masterfully displays that ability here throughout the course of song, leading you exactly where he wants, up and down the emotional ladder until you’re as wrung out as he is. Which brings us back to music that accompanies all this, which by now has settled in comfortably and like Roy the singer, we see that Roy the arranger, or whoever took on that task in the studio on this date, has a few surprises left up their sleeve starting with the subtle (but thankful) reappearance of the electric guitar that left such a strong impression on the top side of this single. Here it’s never quite as prominent as it was on the flip, but just when you are resigned to its absence altogether here it comes halfway through, deftly weaving its way through the brass, which gets eased ever so slightly back into the mix, until it’s the guitar lines that wind up capturing your attention, particularly a sudden twangy note that seems to cry out, mimicking or mocking Brown in the process, yet with a decidedly different tone to make it stand out even though it’s relatively brief. As for those horns, well, they improve too, as they never resume their assault on the more modern senses of late 1948 with the already dated trumpet squawks that marred the opening and had you thinking this might’ve even been recorded a year earlier and kept on the shelf until now. The full horn section, with saxes, becomes a little more muscular, still not utilized to their full effect by letting them honk mind you, but then again with the mournful subject you start to see how they felt they needed them to play in a manner befitting that mood. Ironically that despair, as fitting as it is and as impressive as it is that it’s conveyed so well, might be what keeps this from being a truly great record, or rather a great listening experience beyond that first spin where you wait anxiously to see how it unfolds. ‘Fore Day In The Morning remains a song that you aren’t able to jump headlong into at a moment’s notice and fully enjoy listening to. It requires a less festive mindset than most rock thrives on making it unsuited for playing in group settings and better left to when you’re all alone one dark and dreary night, wrestling with your own unvanquished demons. That’s when it will be most effective, connecting emotionally with the listener who is either facing the same situation themselves, or at least in an environment where they can imagine themselves in a similar predicament. That’s the trade-off you make with Roy on anguished performances such as this, he’ll let you see him broken-hearted, analyzing his state of mind, but in doing so, as fascinating as the experience may be, you won’t necessarily race back for another voyeuristic glimpse of his psychological breakdown until you’ve sufficiently recovered yourself. In the end – as much as I hate to come almost full circle in the course of the same review and admit I may have been wrong when starting out – it’s plainly obvious they knew what they’re doing all along, showing that the praise earned on Rainy Weather Blues for fully grasping the nuances of the arranging process wasn’t a fluke. They get it here too, it’s just a shame that the opening – as a stand alone piece of music designed to capture your attention and pull you in – is the weakest aspect of the entire record from a stylistic point of view, especially because we don’t know at that point what’s to follow and thus may not be convinced that it’s worth sticking around to find out. Once we do know then it all comes together and our appreciation for it grows, even though in doing so it understandably trades in audience accessibility for its cathartic power. But regardless of how comfortable a listening experience it is at times, it will surely teach us never to underestimate Roy Brown again, harshly reprimanding us in fact for not learning our lesson from his previous records when he’s consistently shown that he’s looking to cross you up somewhere along the way while still delivering the goods. With ‘Fore Day In The Morning, once again, he does just that and we’re won over in the end, as was the rock fan of the day. 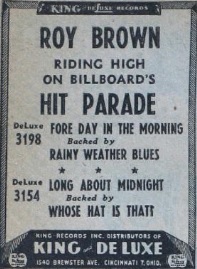 Both sides became hits and while “Rainy Weather” actually got one spot higher on the Billboard Race Charts (#5 compared to #6) as befitting its more accessible nature as well as mirroring (just barely) our own impressions of the strength of the two sides, this one stands up as well once you take the time to study its construction. Though not a song that’s easily embraced by any means, ultimately it’s one you have to admire for displaying such naked emotion even if the harrowing journey he takes you on is anything but comfortable. 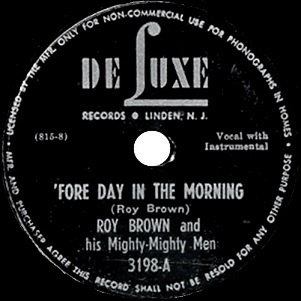 Leave a reply on "Roy Brown: “‘Fore Day In The Morning”"